It wasn't just his war record or the fact that he knew several different ways to kill you that made Roosevelt such a badass. It wasn't even the fact that he kept a bear and a lion at the White House as pets, (though that certainly helps). Teddy Roosevelt was a badass of the people. 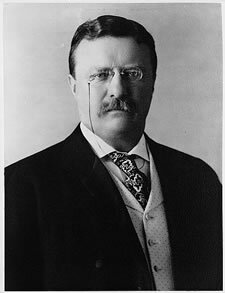 Roosevelt received letters from army cavalrymen complaining about having to ride 25 miles a day for training and, in response, Teddy rode horseback for 100 miles, from sunrise to sunset, at 51 years old, effectively rescinding anyone's right to complain about anything, ever again. Did we mention he had asthma growing up? He did, and after he beat asthma to death, he ate asthma's raw flesh and ran 100 straight miles off the energy it gave him. Seward's attitude toward slavery was shaped while traveling through the South in 1835. In 1846, he became the center of controversy in his hometown when he defended, in separate cases, two African American men accused of murder. Both had been inmates with a history of mental problems and were severely abused while in prison. Seward argued on behalf of both men using the relatively new insanity defense in an effort to prevent their execution. "The color of the prisoner's skin and the form of his features are not impressed upon the spiritual immortal mind which works beneath," he said. "He is still your brother, and mine ... the image of our Maker." Both men, however, were convicted -- one executed and the other dying in prison while Seward appealed his case. Elected to the U.S. Senate in 1849, he believed slavery was morally wrong and while acknowledging that it was legal under the Constitution, he denied that the Constitution recognized or protected slavery. "There is a higher law than the Constitution," he said in 1850. Seward went on to become Secretary of State under Lincoln and Johnson -- he was the one who swung the deal for Alaska, which people called "Seward's Folly" at the time. Of course, Alaska turned out to be have all sorts of oil and it kept the Soviets from parking nuclear missiles in North America. So, who's laughing now? He survived a stabbing from an assassination attempt. And Seward's last words on his deathbed: "Love one another."